Today: Don't resign yourself to brown dinners just yet. 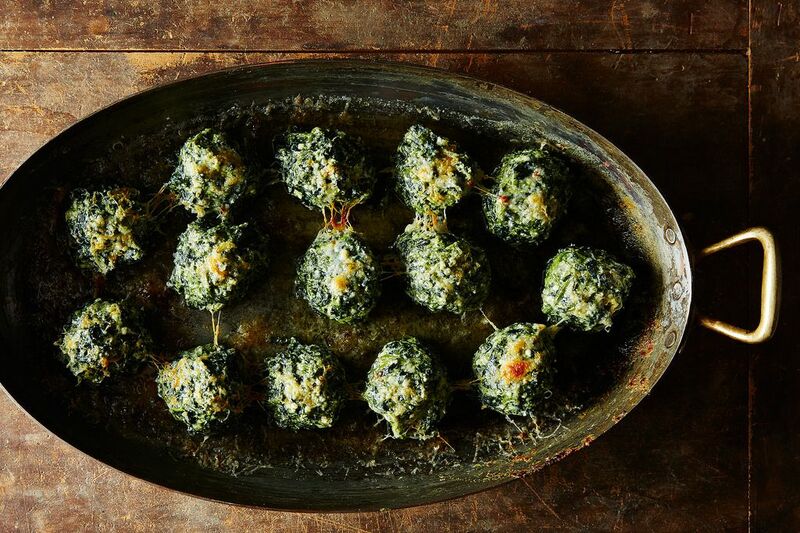 Take a look in your freezer (or in the freezer aisle), thaw the frozen spinach, and sculpt it into something beautiful (and cheesy). If you are someone who can make frozen spinach into a meal that is not only entirely edible but also entirely appealing, you are a true artist. It’s no surprise, then, that I learned about this particular dish -- which reaps the rewards of frozen greens and leaves any scariness behind -- from my friend Nancy, who is a painter, drawer, potter, and collector. Nancy is a woman who collects dead dragonflies from sidewalks and cloudy shards of glass from highway shoulders; who has almost too many cats (but really, not enough); who hangs rusty wrenches on the wall next to her own watercolors; who devotes an entire room of her house to succulents; and who, earlier this year, fought (and won) a 3-week battle with a raccoon that made a home in her kitchen and used Nancy's husband’s sculptures as its jungle gym. As for cooking, Nancy is the type who has a gravity-defying tower of new cookbooks yet turns to Time Life Books’ Food of the World set, published in 1968, when she’s entertaining company. "The Cooking of Italy" booklet, which you are more likely find in an attic then a kitchen, splays open to her favorite recipe: Gnocchi Verde. After more than forty years, this recipe is still artful in its thrift, offering a way to cope with the produce that's available, if not at the market, than in the freezer aisle. The recipe is simple enough that you can be the artist, sculpting frozen spinach into leaf-green orbs for a solo, 10 PM-on-a-Monday dinner. But you should also remember this recipe when you have enough energy to turn that dinner into a party, and that's because these gnocchi are also artful regardless of their thrift. Make them if you have all of the ingredients on hand, but go to the grocery store if you don’t. And if it’s spring, buy fresh spinach. 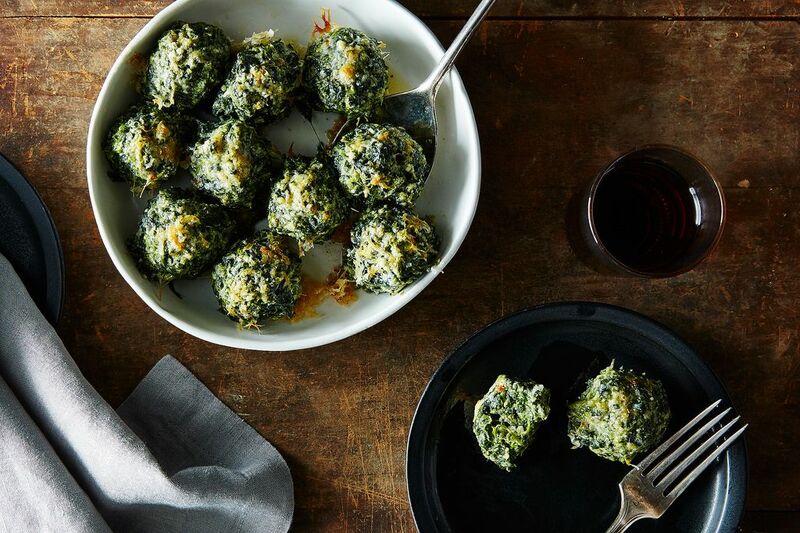 You’ll mix the greens -- fresh or frozen -- with ricotta, eggs, and just a bit of flour. Chill the gnocchi, shape the loose mixture into small balls, boil these in simmering water until bobbing, and then nestle them into an oven-proof dish. Cover the dumplings with finely grated Parmesan, bathe them in butter, then set the pan underneath the broiler. The gnocchi will emerge -- as most food from the broiler does -- tanned and irresistible. Underneath crackly threads of broiled Parmesan are little pockets of creamed spinach in need only of some crusty bread, a glass of red wine, and, if you’re having company, a salad with some crunch. These dumplings will dissolve in your mouth in a way that -- despite our greatest efforts -- finicky potato gnocchi almost never do. This recipe is my reminder to return to my battered cookbooks and my dated recipes even as I make room on my shelf for Prune and the latest from Christina Tosi. It's also a reminder that, instead of pining for frisée and Bibb lettuce as I pour myself a bowl of cereal for dinner, I have the option of looking at frozen spinach like an artist (or an optimist) would, of finding its potential to become something beautiful. Mine fell apart in the water, so baked the rest... I used cassava flour as the binder, maybe that was the issue? Great recipe! I was wondering if these freeze well after cooking? Are we using fresh ricotta or the supermarket stuff? Some raccoons can be quite pleasant. Same problem here. I am going to try subbing soft tofu for the ricotta. Making them tonight with pasta. Maybe orzo? I would try them over a long, dangly pasta, like fettuccine! Done! Thanks for the suggestion. I wasn't sure what style to go with. I definitely going to try this one. Just looked it up, page 32. My name is Nancy, also an artist, and I happen to be preparing a fabulous meal for my guests from the "African Cooking" book from the "Foods of the World" series. I was wondering if anyone else actually used these anymore! Oh yes, Time Life Books FOODS OF THE WORLD series cookbooks are fantastic! I've bought several sets of them on eBay. I love the historical background they provide about each cuisine, as well as the beautiful photography. They are so well written that I often sit down and read them just for the joy of it. I guess you know they come in sets of two books: a large, hardbound, coffee table type with photos & narrative, and its spiral-bound partner with detailed recipes for every outstanding dish. Yes, very wise good cooks DO still use these wonderful books. They are a treasure. Enjoy! Thanks, that's wonderful to hear! Yes, I have the whole set, (hard and spiral copies), a gift from my mom, around 1970. I totally agree with you, and I love the fact that, for instance, MFK Fisher was the the author of the Provincial French book, and Julia Child, the consultant! Around 1980, Time Life came out with a 27 edition version called "The Good Cook," which was also very well done. You too, enjoy! Nice to hear from another appreciative member of the club! Yes! Very nice to hear, and so interesting. The snubbers are simply snobs. Great set of books!!! Still enjoy mine. Have used information in the classroom and while traveling. Sarah, do you think chickpea flour or some other non-wheat flours will do? Cool! Thanks Sarah. Firm tofu may work in the place of ricotta....ok now I can't wait to go home and try it tonight! Just loved these. Thanks, Sarah. Looks marvelous, exactly the sort of thing I'd love to have on a cold winter's night. Isn't this the same as gnudi? 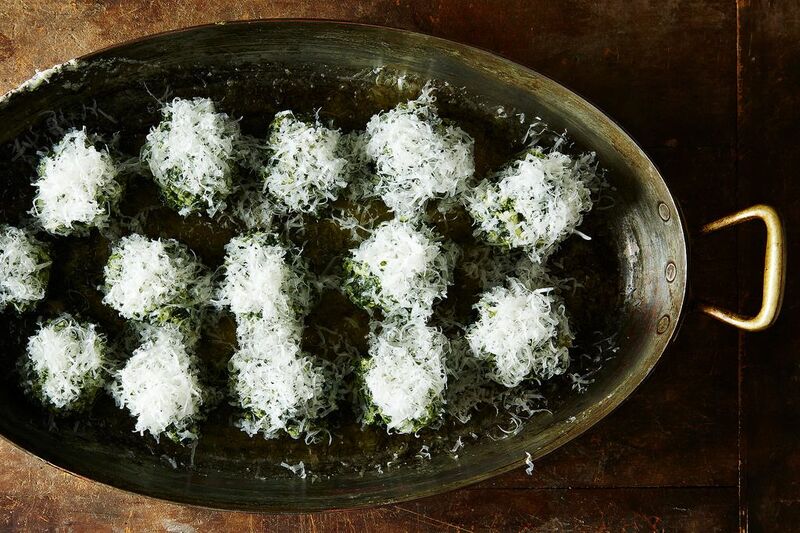 Yes, these are also known as spinach gnudi! Gnudi -- ricotta dumplings made with just a little bit of flour -- can be flavored with all sorts of vegetables (or left plain). Nancy sounds incredible. As does this dish. Ditto. Can we throw a dinner party with Nancy? And cook this?